We saw that all methods need return types or the word void for no return type. However, there is one exception: constructors. This is because a constructor is called when an object is created, so it 'returns' the Object itself and cannot return anything else. A constructor is created by simply writing a method with the same name as the class itself (including the capitalization). The constructor is usually used to set up the values of variables in the object and run any methods that need to be run on creation. Like any method, a constructor can take any number of parameters. 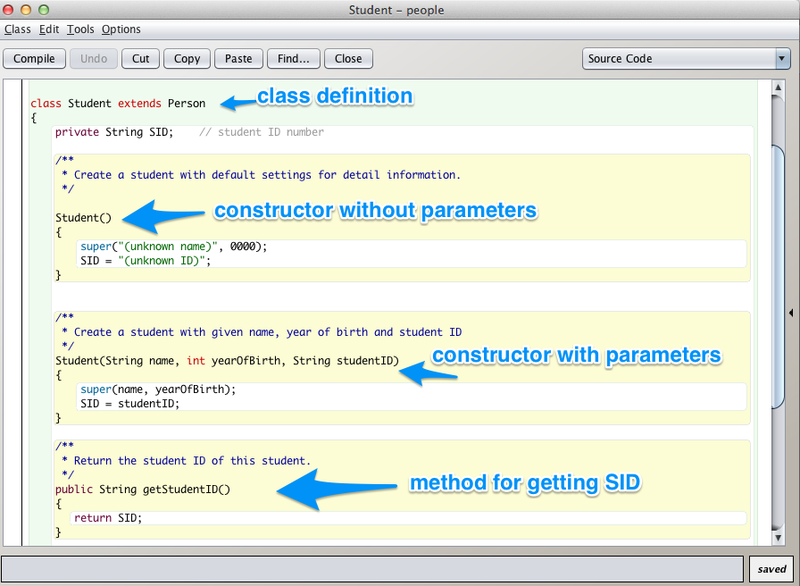 As mentioned, a class can have multiple constructors as long as each one has different parameters. you need to set color and sunroof in the constructors (where the comments are). The second constructor should also take in a variable for color and assign it. You first need to fix all the compile errors. See the hint I added to get started and simply assign the Car's variables. why its show me a compile error? That usually means you're missing an }. You can write some of the code for these challenges in BlueJ (or another IDE) so you can see compile errors quickly. What is not correct please?? You're pretty close, but you need to make sure you're taking the value of the parameter and assigning it to the instance variable. instanceVariable = parameter;. The instance variable (declared at the beginning of the class) is on the left side, while the parameter (passed in through the parentheses) is on the right side. See this solution for the full code.